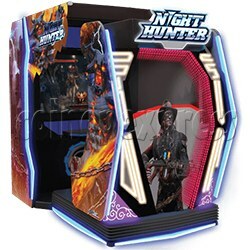 Night Hunter 4D Gun Shooting Simulator is a 4D of sorts which have elements such as motion and air blasts video shooting game machine from the sequel of sorts to After Dark. It is made in a motion deluxe cabinet, feature with the motion platform with force-feedback guns and the steering wheel, this adds a lever for changing player ammo type. In the game, player journey through stages filled with zombies and vampires, the fight add creatures on player's way to battle flying demons with the occasional "wheel" event, made the game more exciting. Players shoots the zombies and vampires by the vibrating guns, drive through the underworld with the steering wheel. It is a fun and exciting simulator shooting game, suitable for the teenagers and adults.